This is the 100th edition of The Tour de France and runs from June 29th until finishing on the Champs-Elysées on July 21st. Bradley Wiggins will not be defending his crown but Britain’s Chris Froome is the odds on favourite. 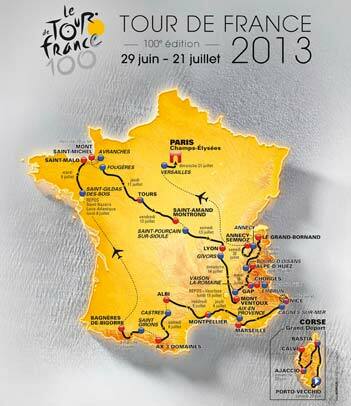 The 2013 tour covers 3,479 km’s & includes just two rest days. Trevor Leggett, Chief Executive of Leggett Immobilier, looks at the route the cyclists will take and some of the houses for sale on six of the key stages. stage 4 (Tuesday July 2nd) in Nice. “Nice is one of the few places in Europe that seems to be recession proof as international buyers seek a safe haven. The average price of properties sold in the Alpes Maritimes last year was €436,200 and prices rise dramatically if you want to take advantage of the beautiful coastline or are seeking something within the old town of Nice itself. Our Cote d’Azur team are marketing a beautiful “Belle Epoque” villa in the Cimiez quarter of Nice. 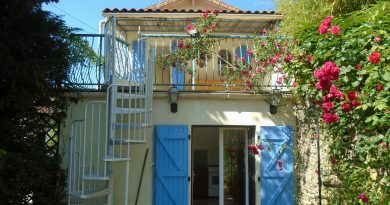 It’s a quiet, residential area close to all amenities including two of the best schools in Nice. The owners are asking €959,500 for this six bedroomed classic”. stage 5 (Wednesday July 3rd) runs from Cagnes sur Mer to Marseille and could be set up for British sprinter Mark Cavendish. stage 8 (Saturday July 6th) runs from Castres to Ax 3 Domaines and is the first summit finish of the 2013 tour. stage 10 (Tuesday July 9th) takes us to northern France and runs from St Gildas des Bois to St Malo. Once again, Britains Mark Cavendish will be looking for victory. stage 19 (Friday July 19th) is probably the hardest day of the tour as there are five alpine mountains to climb. It is here that Chris Froome could well wrap up the 2013 race. stage 21 (Sunday July 21st) is the final day finishing on the iconic Champs Elysees – will we see a British winner two years running?